A couple of weeks ago, I participated in the Chrysler Blogger Face Off, and towards the end of the contest, I was contacted by the PR Group for Chrysler and told that I would be given a iPad 2 to give to one of my readers. Like I promised, I am giving away a iPad to one of my readers as a thank you for helping me get the votes. True I did not win, but it was a very close contest and I am very appreciative of all of the support I got from my amazing readers!!!! 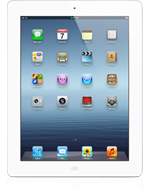 Well, instead of the iPad2, that I originally thought I would be giving away, I will be giving away a new iPad 3 with WiFi and 16GB!!! Just leave a comment on why you want to win!!!! Please leave me your email with this entry!!!!!!!! This giveaway is open to US residents. This giveaway will end at 11:59 pm on April 29,2012. Winner will be chosen at random.org and will be given 48 hours before another winner will be chosen. All products for reviews and giveaways are given as a sample from the companies. All opinions in reviews I conduct are my own. I was not paid to say anything or review any products. The iPad 3 is provided by the PR Group for Chrysler!!!!! Next Post Fill Your Easter Baskets With Plush's From Gund! OMG and iPad3. Since the day they came out I have been groveling at the page and wishing I had an extra $500 to get it. I have never had an iPad but all the promotion they did on this one caught my eye and now I would love one very badly. For me it's the dual cameras that really catch my eye, I would love to have this to take great shots of the grandkids and also for surfing the web!! Whoohooo! Congrats on your win! Commented:The Muppets on Blu-Ray and DVD!!! I would use it for home school and to keep in contact with my family. I would love LOVE lOvE to win this!!! This would make doing school work and web browsing easier when new baby gets here in May!!! Just Google +1 this post! I want to win this because it would be the first time I ever had something newer than my kids!wis momworks (at) gmail (dot) comalso to give me freedom to access the web in more places. I will cook and do laundry for you for extra chances!I change litter boxes but not diapers. Hi!! I wld like to win this so I can sell my other tablet/ereader and give that money to my mamaw and papaw to help them out. Dixiedarlin233@aol.com. I'm also on twitter–@trentsdoll23!! Ps. It wld be so lovely to have this when I start back to nursing school!! Hint hint!! This would be our first i(whatever). My boys always beg other people for their iphones, ipads, etc. Now we would have one of our very own! My son graduates in six weeks. It would be a great gift for him. pamiam04468atyahoodotcomI would like to win this for me and only me…not the kids…you hear that kids? Commented:Fill Your Easter Baskets With Plush's From Gund! Commented:OC Daisy Easter Special 50% Off!! I would love to win the iPad 3 so I can video chat with my parents who live out of state. I liked your FB, my FB name is Brittany Wojcik. I followed you with GFC, I +1 this post, I followed with Network Blogs my name there is Brittany Wojcik. I couldn't figure out how to sign up by email though. And finally I followed twitter and tweeted here's the link to the tweet:https://twitter.com/#!/Reylenra/status/186636274759766016Thank you so much for this opportunity!! Entered the GourmetGiftBaskets.com Brownie Sampler giveaway at mommykatie.com Thanks for the chance! I would love to win – then my kids could have an iPad of their own! inlibrislibertum@gmail.comI want to win this for my husband. His laptop is old and finally died out. He deserves a new fun toy. I like your new facebook page (Wendy T). Google +1'd this post (Wendy T).